There are comparable differences among Democrats across income categories. Democrats with annual family incomes of at least $100,000 are the least likely group to support the pipeline: about half (51%) oppose Keystone and 36% support it. Those with incomes between $50,000 and $100,000 are divided, while there is more support than opposition among those with family incomes of less than $50,000. As Pew Research polls last year found, moderate and conservative Democrats continue to be far more likely than liberals to favor building the pipeline (56% vs. 40%). 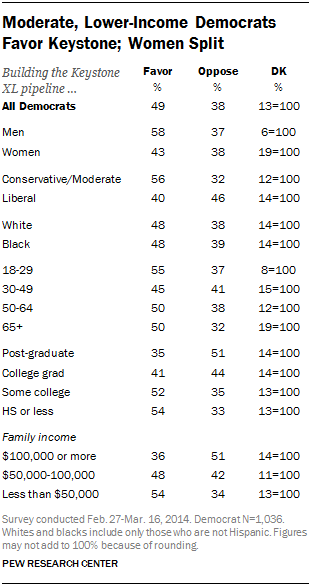 In addition, there is less support for Keystone among Democratic women than men. About as many women oppose (38%) as favor (43%) the pipeline, with 19% offering no opinion. 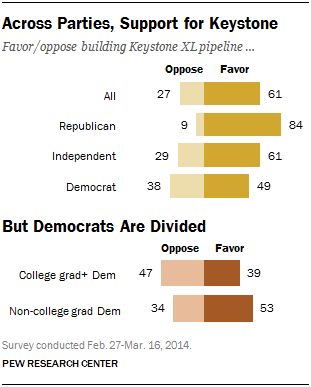 By comparison, a 58% majority of Democratic men favor Keystone and just 37% oppose it. Republicans also differ over the pipeline, but large majorities across all GOP groups favor its construction, including 94% of Tea Party Republicans and 78% of non-Tea Party Republicans. Greater shares of Republican men than women support Keystone (90% vs. 78%). Unlike Democrats, there are no significant differences by education or income level among Republicans.